Surfing — meditation for people who can’t sit still. I had quite a sublime experience. It was the golden hour, the last hour of sunshine where the lighting goes all magical. Dappled lighting fell across the water, playfully casting an iridescent glow. A concoction of colours bled across the sky, always transient as the next one swept by. The sky turned a violent shade of violet as the blue ‘hour’ approached. Twilight lingered briefly in a period of neither daylight or darkness, and then night set in. All this time I sat on my board. Calm and still. Enchanted by the smell of coconut surf wax, the taste of salt water, the distant echo of waves and the feeling of the smooth water engulfing me. My desire to paddle for waves faded, as I become more and more lost in my musings. I just sat and reflected. At risk of sounding cheesy, I felt happiness and peace. There is something quite magical about surfing, and this is coming from a complete rookie. Being immersed in the ocean, thrown about it it’s mercy. I feel alive… Adrenaline dancing through my body. And I’ve found my new favourite hour to surf. The fact that it’s also shark feeding hour is pushed far into the deepest recesses of my mind. 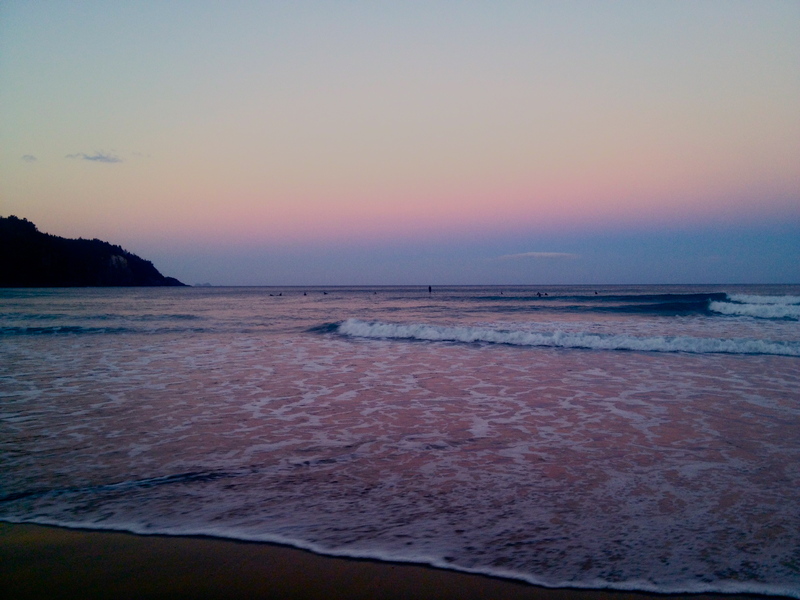 thanks, captures the vibe of the water at dusk… such a beautiful time of the night! All words fresh from the surf!